The Czech machines/engineering industry continues to benefit from the solid performance of the Czech economy, which grew 4.3% in 2015 and is expected to increase 2.4% in 2016 and 2.7% in 2017. The currently growing domestic automotive industry is a main customer for machines. Additionally, machinery demand from the construction sector has picked up again. The very export-oriented Czech machinery industry also benefits from the recovery in the Eurozone and a stable koruna-euro exchange rate. The appreciation of the US dollar against the koruna helps machinery businesses when exporting to overseas markets. Higher demand and the decrease in commodity prices has led to increased margins over the past 12 months. Machinery companies’ equity is above the average of all manufacturing sectors. 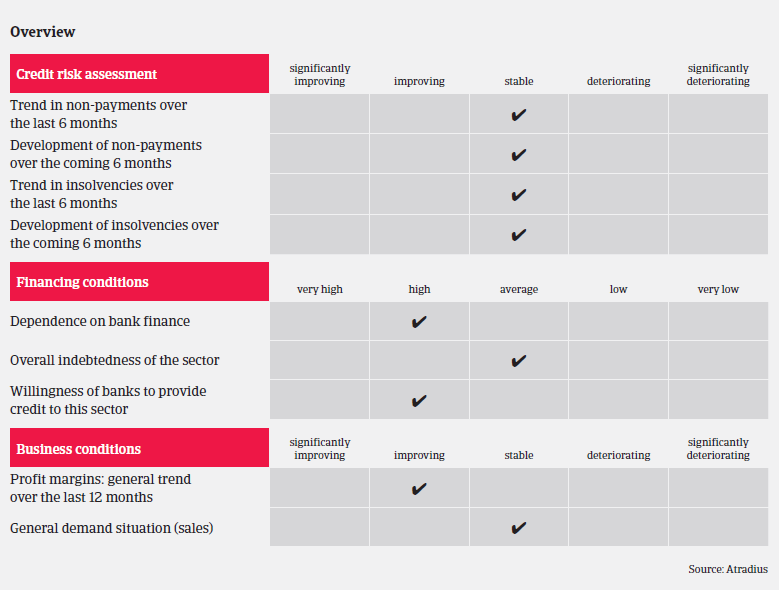 While dependence on bank finance is average, banks are positive about the sector in general, providing enough liquidity. However, performance varies across machinery subsectors. As mentioned above, the outlook for manufacturing machines is positive, and the agriculture machines subsector benefits from increasing demand and better financial results of customers in the agro-business segment. That said, machinery businesses depending on exports to Russia face cash collection problems and have to compete on new markets. At the same time, machinery producers dependent on energy and mining and the power engineering sectors continue to face difficulties. On average, payments in the Czech machinery/engineering sector take between 30 days and 60 days, depending on the segment. Sometimes prepayments are needed if special tools are manufactured. The level of protracted payments is high, often due to disputes, long inventory of accounts receivables or project delays. Non-payment notifications are not expected to increase in the coming months. The number of insolvencies in the industry is average compared to other industries, and no major increase is expected in the second half of 2016. Our underwriting approach to the machinery sector remains relatively open, depending on the performance of single subsectors. When asked by a client in this sector to assess a buyer’s creditworthiness, we look at our client’s own trading experience with the buyer, check the buyer’s key financial figures, distribution of receivables, creditors and stocks to ensure that they are within an acceptable range. However, we still pay extra attention to machinery companies dependent on the construction industry.